Versus CluClu Land: So Close! Curious about your reaction to the downloadable bonus levels then. Some people say that's what the game should have been all along; personally, the abstraction took out some of the excitement. As did the fact that you were just running, instead of running away from bullets or after nemeses. No matter the issues, I was still glad to have played something that took a chance on something refreshing. Just wondering: were you playing the console or the PC version? I played it initially on the PS3 and encountered many of the same frustrations, but on a PC, with a keyboard/mouse setup: the levels seemed to click, and the first 3/4ths of the game were excellent, exhilarating fun, and rarely felt finicky. Great read. I agree with almost everything you said. The horrible combat also interfered with the pacing of the game and delivery of the world. One of my favourite sections in the game is the trial rooms, where you discover the training course for (spoiler) the police runners, and have to navigate it yourself as (a by-now expert) runner. But rather than enjoying this moment of big narrative twist, and sizing up the training course for an exciting run... the game dumps two police runners into the room with you, forcing you to take it all in at a breakneck pace. The storytelling is brushed aside by the need to run away from a difficult fight, and that annoyed me, because it was a great piece of architecture telling a story (as opposed, say, to the boring shopping mall). Again, I agree with so much here; I enjoyed Mirror's Edge a lot, and didn't quite hate the combat as much as you (but not much less, to be fair), but cannot deny the big problems it has. Running across rooftops, though, gosh it's good. I think the demanding platforming actually enhanced my enjoyment of the game. The game demands a precision and level of mastery that most games shy away from. I felt like I really had to learn how to gauge jumps and mix my speed with smarts. The game doesn't posit that Faith is a badass and try to make you feel like her, it gives you the tools to make yourself feel powerful, and demands that you learn how to use those tools. For comparison in a different genre, God of War uses the first philosophy, and Devil May Cry follows the second. Neither one is wrong or right, per se, I'm personally glad that both designs can coexist. But I do tend to prefer empowering myself than vicarious empowerment through an overpowered character. The combat is terrible though. Pulling off a flying kick to buy you enough time to make the jump to the next roof is satisfying, and being able to take a gun and then realize it's worthless and just slows you down is a beautiful thing. But any time you've got more than one enemy in front of you, it breaks down. It feels like they tried to hedge their bets and it backfired by compromising their vision. Penny Arcade's Tycho - or Jerry - or whatever said that by including the heavy combat sections DICE "did violence to their creation," and I'm inclined to agree. I found the difficult platforming blissful. Had it been easier, I doubt I would have felt the sense of accomplishment I experienced. I agree the gun combat was out of place. I'd rather have only seen melee style combat where the real purpose of the opponents was to position them and then use them as spring boards to access even higher ledges or cross wider gaps. Other than matching some of the insane time trials I've completed the game to my sanctification and look forward to a sequel. Actually, one of the most interesting things about Mirror's Edge for me was how its levels offered a lot more options for sprinting and clambering that were immediately apparent. At a macro level, you still have to get from point A to B, but the ways that can be executed are surprisingly diverse. This wasn't something I noticed until playing the time trials. But in doing so, I discovered areas that previously seemed to only have a single viable path actually had numerous shorter and faster routes. It's actually pretty commendable DICE was able to create maps for time trials that are so rich. Time trial modes usually only offer one way to improve- strive for more flawless execution. Mirror's Edge (and similarly, Burnout: Paradise) provide an environment that consistently rewards seeking the superior path. It's just a shame that only really comes out in the time trial modes, instead of in the story mode as well. Re gun combat, I liked the idea of avoiding gunplay thematically, so I choose not to use guns entirely to go for the Test of Faith achievement. It ramped up the difficulty of a few combat engagements here and there, but not so much to be overly frustrating, especially compared to the frustration I was already feeling as a result of the level design. As I mentioned in my own review, I really really wanted to love Mirror's Edge. While I did play to completion, my ultimate reaction was disappointment, and I felt a bit let down by what could've been a hell of a title. The food analogy is a good one; let's hope they get the ingredients right next time around. @brian: I've heard from reliable quarters that the downloadable levels were great but they're too rich for my blood. I think that @nelsormensch's comments are very salient on this point; given that the non-running portions of the game are so bad, it works best as a first-person racing game than a first-person anti-fascist adventure. In the context of a time trial the trial-and-error elements of the gameplay are much less grating. @sottai: I played on 360, but you may be right that the precision afforded by the mouse controls clears up the problems I mention in the article. @tom: this is a good point: when you run into that runner's course in the security building, this is a great opportunity for environmental storytelling in a game that sorely needed environmental personality. And it's squandered. @julian: I agree with you that the satisfaction of making difficult jumps in Mirror's edge was more pleasurable than, say, the overly liberal platforming tolerances in Prince of Persia. However, I felt the stringency of the platforming (not to mention, of course, the combat!!) worked against the game's biggest pleasures, because it made it difficult if not impossible to quickly navigate new spaces as you came into an area-- it broke up the flow of the experience. Maybe my basic pleasure in the game was slightly different from yours, and that's what's causing the difference in perspective here. It wasn't just sprinting across rooftops that got me hooked, it was the feeling of constantly being on the edge of death, from a sniper bullet, from a police-state thug, from a missed step. And then learning to cope with the immediate and ever-present threat of death, to cheat death with a complex string of acrobatic maneuvers. Most of the slower more puzzle-like segments and long elevator rides were a necessary respite for me. I was also pretty hard on myself when playing the game. If I stumbled, a part of me wanted to go back and get it right, a part that was frequently overridden police helicopters and suspiciously heavily-armed police. Notice I'm the one stumbling not Faith, and it's not the game's fault for tripping me up. That experience of owning every step, of my input being the absolute determining factor in my success or failure, and of the game being willing to let me fail, is what I loved about the game. The game refusing to step in and help me made every successfully landed jump, every crazy wallrun-to-wallclimb-spin-to-triangle-jump ring true. It's like a bike without training wheels. If you're used to them, falling over is frustrating and constantly interrupts the flow of the experience and the sensation of speed. But once you get it down, how much more satisfying does it feel to just ride? I didn't even get as far as the shooting in Crackdown. "I can jump really high? MONEY." I think the notion of vertical theatrics in games is ready for a dissertation. Jumping Flash, Crackdown, Pixeljunk Eden, and now Mirror's Edge... I played them all for that same sense of ascension. Hell, the best part of San Andreas was finding ways to get on top of those huge buildings with a motorcycle and then riding off the edge. Maybe I just have some weird height fetish. Even the core Mario games are all about the goddamn jump. It's probably the whole ziggurat thing that's been entwined with the human drive for however long. From the Tower of Babel to Lunacy to even the Tower tarot card, there's so much that can be explored as to why games like Mirror's Edge have that certain appeal, even when they are obviously not very good games. I'm not sure if you're familiar with Surfergirl (a retired supposed industry insider), but she once covered a canceled game named Freefall that was more or less a first person gravity simulator. The player would fall from the moon to Earth within a 65,000 mile space tower, trying to avoid architectural elements while reaching terminal velocity. That very idea, to me, was thrilling. Maybe it's more of a craving for weightlessness than height. I'm like Julian -- I thought Mirror's Edge was exceptionally good at conveying a frantic, edge-of-your-seat thrill by forcing you to make quick decisions and quite demanding motions in order to escape and survive. I understand that people become frustrated when that amazing flow is interrupted, but maintaining that flow under duress is the game's central challenge. I always tell people to play through Mirror's Edge a second time -- because then you're AWESOME and you know what you're doing. As for the combat, well, I'm not really sure I'd call it awful. Basically, the problem is more with the level design -- if you're not sure where to go, you tend to hang around in enemy-infested areas for longer than you should. The skewed difficulty in the fighting made logical sense to me (scrawny punching swat dudes) -- of course you're going to lose against those odds. It's hard, but I don't think it's badly designed -- just forced on you too often, considering that escape is always the best option. 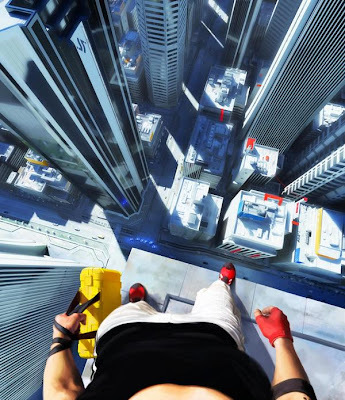 Mirrors edge is a real deal game.